in TN 07 AL 4777. For Meenakshi this time. For those who have just come in, TN.... is a remake of Taxi 9211. And Meenakshi is essaying the role of Sameera Reddy. The director Lakshmikantan has been the one with whom several hours have been spent at the dubbing studio learning the ropes of the skill. Read, Unnale Unnale and Dhaam Dhoom. Though Lakshmikantan anna was not part of DD in the beginning, he came in a little later. And the dubbing sessions at Trinity have been the best. Most of the movies I have dubbed for have been done there. UU, DD, Satham Podadhey and now TN07 AL 4777 have been done at Trinity. I am given to understand that the brain behind this place is Mr Lakshminarayan, 6 time National Award winner. Could be more but I forget the exact number now. Lakshmikantan has a "punai peyar" which is "singam" .. So it goes like Singam this, singam that by the people in the studio. A lot of times I have felt that the lot of acting happens in the dubbing studio by means of extracting the right voice quality and delivery from the artistes. And believe me, to be at the receiving end and to judge the right take from several and more than anything else, to know what they want in a particular take and to get it from the artiste - this talent according to me is non pareil. I wonder how all of them manage that. The amount of voice acting that the engineers can do is amazing. If a voice artiste is unable to figure out how to say a particular line, the engineers say it and all that we have to do is just copy their feel. A lot of the hilarious times in my life have been at the dubbing studio. To remember the Bucket list, to laugh hard enough to cry, have done that at the dubbing studios. Yes, as I have mentioned earlier, it can be tiring as well, as sometimes the right delivery just doesn't happen, or the clarity might be missing, or a certain voice quality that is fixed for the particular heroine, during the screen test needs to be maintained from beginning to end, and its but natural to forget that particular tone. But the engineers know exactly when the quality changes and when tiredness sets in the voice. At that point they reschedule to finish the remaining work. To be supervising the dubbing requires a lot of skill apparently and the engineers at the console are usually the ones who take over and direct the artiste, as far as I have heard. Lakshmikantan is one of those super people who have that skill. He is also one of the most sincere and straightforward people I have met. Has the guts to call something crappy on the face and like most creative people in the industry, an amazing sense of humour. We have all laughed so hard that we have cried. Sometimes I would complain on being unable to lip-sync with the heroine. And the way we ll all go into peals of laughter cos there either the engineers or he would start off on something. More often than not, a heroine does not know the language. And I marvel at how the actors are able to do their job with a straight face and do really well too. For all you know the girl in front of him is just blubb-blipp-blurbing. I remember SPB sir mentioning, he was dubbing for a hero and that the heroine in that particular movie, said just A, B, C.. and the entire alphabet in a certain manner and emoted for the remaning part. Once the alphabets were over, the numerals start.. 1... 2-3-4.. 5......some tears.. 6-7-8-9-10. Finish with anger. Imagine whatever you want. Some day, I intend to take interviews of the engineers and post it here. Someday. Sometimes people, even those I work with, ask me to not host, not dub, not do radio. At the risk of repeating myself, I have one motto, to learn and keep learning. I am offered the opportunities. So let me try. One lifetime. So much to do. So less time. Most of my energies have and will always go into music and learning the art form. There can only be a quest for perfection as I see. Perfection is something, maybe, that cannot be achieved. If you think you have achieved it, maybe thats it. What else is there? After one milestone is reached, the eyes search for the next one, gauge how far it is and choose the righteous path to reach it. At the end of your life, how can you ever be sure that you have made reasonable use of the time offered to you ?? Acheiving perfection in singing ?? Understanding as much as you can..?? Learning ?? Talking about heroines' 1-2-3, have you seen Taai veedu (Rajnikant- Anita raaj)? Anita raaj says her dialogues in Hindi and later dubbed in tamizh by the dubbing artiste. And no, Taai veedu is not a dubbed film. Wishes for ur upcoming films..heard ur voice for padmapriya in satham podathey, Awesome! Excellent output of ur voice akka,i hav already known that u hav dubbed for her and then watched that film ,and the climax dialogue delivery especially that crying and shouting scenes should be very much applauded.I was just imagining how would u haV reacted in those scenes. why dubbing artiste won't act as heroines in movies? I wish the movies might be better. I appreciate your motto to learn,Keep learning. Life is what we get, happiness what we make frm it.! வாய்ஸ் ஆனவங்க என்பதன் அர்த்தம் இதுதானோ!!! Was absolutely shocked and a bit amused...pls. do check it out..if you have'nt already. All the best. I believe you will shine in dubbing too. Oh yes .. now i realize why your voice sounded sooo different in UU and V.A-Sameera ..
Do the technicians add anything more to ur natural voice through devices - like adding more huskiness or more echo etc ? or Do they record and play your voice as it is and its in your hands to modulate your voice as decided in screen test? Hey.... You are mesmerising in avaram poo song from Poo. Your diction is damn good in that song. Chinmayi, by all means host, dub, and be an RJ. But (this shd be very much a cliche, but bear with me) please take care of your voice. Make sure that you don't need to shout or strain your voice so much in these "extra curricular" activities. Because, a unique and wonderful voice such as yours is God's gift, and you know how much effort would have gone in training and honing it. And yes, miss you on Super Singer. Come back soon. As such, there is a problem with several pronunciations in Tamil for Tamilians let it be la zha lla and dialects - like - pesareenga, pesuringa, pesareeha, pesureeva, pesudhae, pesarel etc - I think a person like Deepa venkat wd hv had a hell of a time capturing the styles - you are normally not getting your heart in when you dont give voice while acting; Imagine if Veerapandya katt was dubbed for an actor like Kunal..Particularly for heroines, somehow pretty looks have been the criterion - I dont know who gave voice for Nandita Das in Azhagi or for that matter for Navya in Chidamabrathil.. or f Shamita for Paandavar bhoomi.. excellent voice work..even though these are proving a point beyond doubt, people still prefer Namitha; one movie like Paruthi becomes a big hit and the actress chooses movies like Thotta..I dont know what goes wrong and who exactly is to be blamed..for heroines, it is a gratitudeless world but u cant stop sameeras and katrinas coming..
Chin, I dont really know which of the movies you really went for dubbing, we shall be glad to vu or rather listen to it , more importantly, is there anythingelse that you have plans of doing...? rather anything is left still..? Excellent articulation of the topic :). It's hilarious to read SPB sir's experience on the dubbing stuff. Good to see you growing in all faces of the media world. 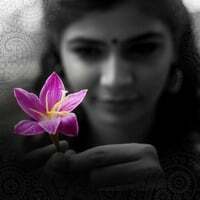 All the best for your future ventures..
Hi Chinmayi, though I have been reading ur blog very often I haven't commented yet. For the past one week, I am listening to ur "Avarampoo" song from Poo movie.My heart compels me to write a comment in ur blog atleast today.The way you have sung the song is great I say. The good lyrics contribute to that too. Man to hear that song feels like awesome :).And you have said that you wonder if there can be a possibility that you can absorb the amount of feeling that has gone into singing Nenje song in your August 13, 2008 post. I would say you have done it!!!!! "One lifetime. So much to do. So less time." Fantastic words Chinmayi! I liked that. Writer Sujatha once translated a poem, don't remember of whom; it said, do something, we come this side (to the world) only once! Regarding perfection, I have seen one interview of Kamal in which he said, he never tries to be perfect. It is not possible to be perfect. But, it is possible to be excellent and he tries to achieve excellence in what he does. How true.